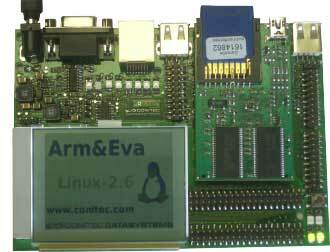 ARM&EVA is a modular system for development of hardware and software for embedded Linux applications - such as the GALEP-5 device programmer series. It consists of a matchbox-sized ARM9 based MCU module that offers sufficient computing power for any application, and the EVA development board that gives you a ready-to-run system. ARM&EVA is the easiest way to build your own embedded Linux application - like a web server that allows controlling machinery via Internet - at an unbeatable low price! At startup, the system boots the preinstalled Linux (Debian with Kernel 2.6) and activates its web server, FTP server, Telnet server and NFS. Without having to program a single line of code, you can immediately 'play around' with the system, access the SD card, display web pages with the web server or run sample programs via Telnet. The included Knoppix CD contains a complete development environment (tool chain) for your applications. In most cases the pre-installed Linux does not need to be modified. You can develop embedded applications as easy as for a PC. Transfer your programs by FTP to the file system of the Flash ROM and to the startup list. After the next reset, your application is started automatically. For expericenced Linux programmers all tools are available for modifying the pre-installed Linux system - including a tools for creating and programming new Flash images. The boot loader can be configured for booting from Flash ROM, SD card, or RS232. The documentation contains all circuit diagrams, the complete source code of the software and a tutorial for getting your application up and running even without previous Linux experience. The MCU module is AT91RM9200 based and offers basic peripheral ports on board. All signals are wired to two 90 pin connectors. Several RAM configurations are available. Ready to go Linux (Debian) with kernel 2.6. Bootable from Dataflash, USB device or RS232. Live CD with GCC-3.3 based tool chain. 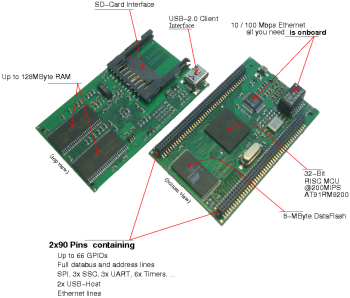 The evaluation board contains all peripherals for a fast setup of embedded system prototypes, including a connector for a gray scale LCD. Connector for an optional 240 x 160 pixel gray scale LCD. All prices and technical data are subject to change.